The ODOROX® Decon Scrubber™ unit is the right choice for removal and decontamination of large volumes of particulate and pollutants from the air. The ODOROX® Decon Scrubber™ unit is finely tuned to eliminate odors and particulate associated with bacterial, viral and mold contamination. 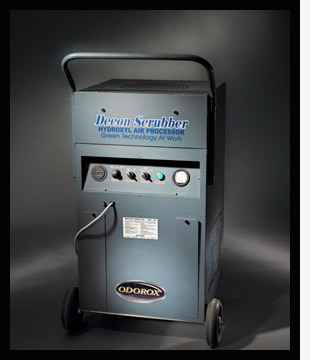 The ODOROX® Decon Scrubber™ unit is designed for removal of large amounts of smoke, ash, animal dander and pollen. The Decon Scrubber™ unit will also remove odors caused by incinerated/burnt plastics, organic matter, and chemicals. ODOROX®, Decon Scrubber™ and HGI Industries Inc. are either registered trademarks or trademarks of HGI Industries Inc. of Boynton Beach, Florida USA. Other trademarks are pending in the U.S. and other countries.